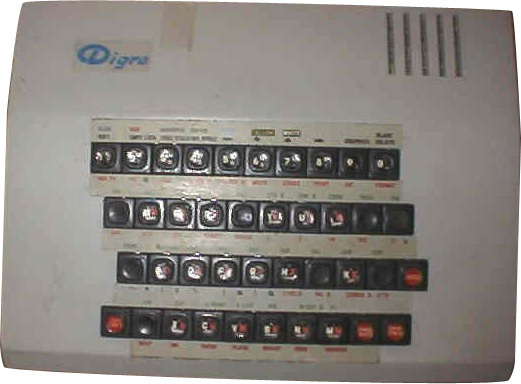 More Sinclair clones were produced in the former Soviet Union than in the rest of the world put together. Although clones were manufactured in several of the former Soviet republics, the Russians were by far the largest users and developers of cloned Sinclair computers. In many cases, the machines were designed and built by electronics enthusiasts reverse-engineering smuggled-in computers. A complicating factor for the Russians was the difference in alphabets; consequently, many Russian Sinclair clones were built with support for both Roman and Cyrillic characters. 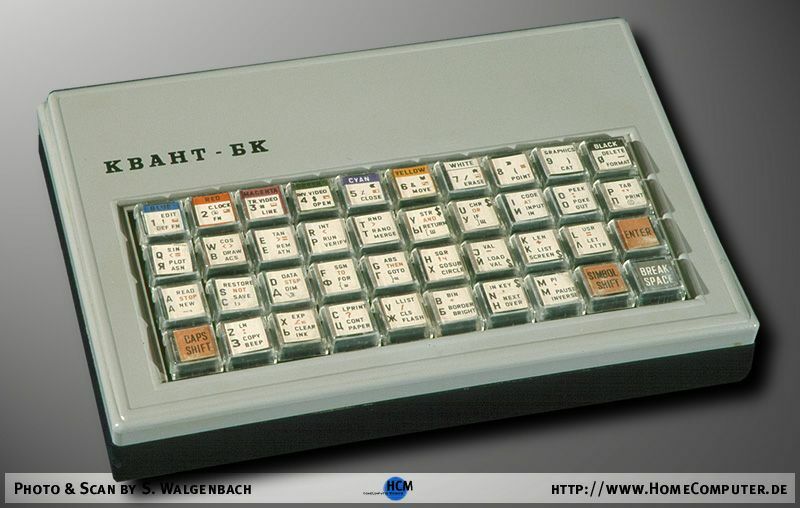 Many Russians are still, to this day, keen Sinclair users, although inevitably the PC is becoming predominant. Spectrum clone built using a Soviet-developed K556PT4 or K155PE3 processor running at 4MHz instead of the 3.54 MHz Z80A used in the real Spectrum. This made it slightly incompatible with the Spectrum. Produced in the Baltic States, hence the name. Generic clone based on the Spectrum+ with virtually identical specifications (the only major addition being Sinclair and Kempston-compatible joystick ports). Produced at Zelenograd, near Moscow. ZX Spectrum clone with considerably different hardware spec. Uses a 7MHz processor. Also includes built-in Kempston and Sinclair joystick interfaces ports, TV and RGB monitor output, printer interface, sound processor and optional disk drive. Produced in Voronezh, Kazan and other cities. (Also reportedly produced in Yugoslavia, although this is presently uncorroborated). Spectrum 128 clone with a floppy disk drive and Kempston and Sinclair joystick ports; somewhat incompatible with the original Spectrum. A Leningrad-produced Spectrum clone with a high degree of compatibility and a considerably improved spec: 3.5 MHz Z80 CPU, 64Kb RAM, twin 5.25" disk drives, three joystick ports, TV and RGB output, parallel and serial ports, support for networking, external disk drives and hard disks. Many Hobbits were produced for use in Russian schools. A second version was produced in 1991 with a 3.5" floppy disk drive in the right-hand part of the case (like the Amiga). A cross between a Spectrum and a modern PC, with 10 MHz CPU, 1Mb RAM and a hard disk drive. Also has Kempston and Sinclair joystick interfaces, a printer interface and support for external disk drives. Produced near Moscow, this Spectrum clone attempted to rectify certain flaws of the earlier Baltica and Leningrad-1 machines. Unfortunately it was itself significantly flawed and failed to win much of a market.
? Russian clone of the Spectrum. Basic Spectrum clone with 64K RAM. More advanced version of the above with 128K RAM and the ability to run run CP/M and TR-DOS. As above, but with 3.5" floppy disk drive. A simple and cheap machine, this Spectrum clone acquired widespread popularity. Not very Spectrum-compatible, due to the way the machine was designed. A much improved version of the above with built-in Kempston joystick compatibility. 1990 Russian clone of the Spectrum. Generic Spectrum clone with hardware spec close to the original: 48Kb RAM, 16Kb ROM and built-in Kempston joystick interface. A generic Spectrum clone from Ivanovo, east of Moscow. May be a later version of the Master. Spectrum clone with 64Mb RAM, made by Peters Plus of Russia. Generic Spectrum clone, available as a build-it-yourself hardware design. For this reason, assembled Mistrums have a wide variety of external appearances, depending on what cases have been used. Generic Spectrum clone. A highly popular machine mass-produced for the Soviet market. Spectrum 128K clone, with built-in printer and joystick interfaces, TV / RGB monitor output but without a sound processor or floppy disk drive. Generic Spectrum clone with built-in joystick port and an ugly round-button keyboard. Built in a case for ease of transport, it was apparently designed for the Soviet elite (this is certainly suggested by the fact that its cost, 650 roubles, represented more than two and a half months' salary for an ordinary worker at the time). Generic Spectrum clone, similar to the Moskva, but without RGB output and with a better speaker. 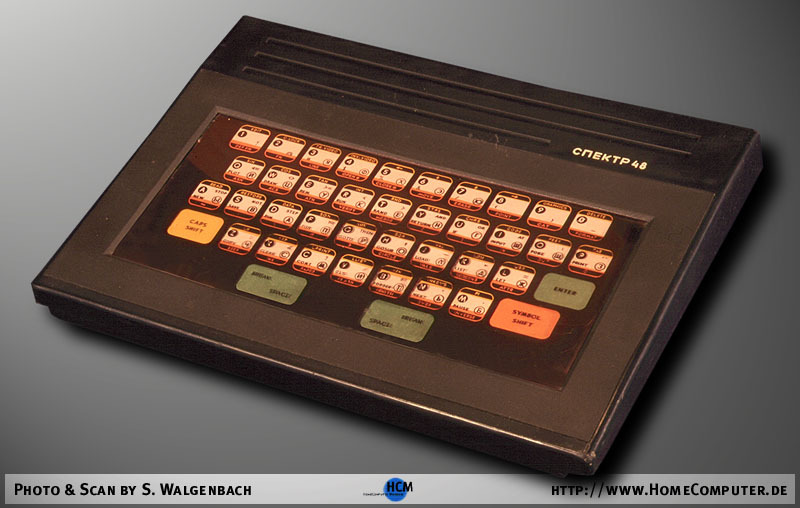 Spectrum 128K clone, similar to the Moskva-128. Like the Mistrum, it is not a brand name but a hardware design to be assembled by the individual user; this means that individual machines can look and be considerably different. The current standard configuration is a Pentagon 512 Turbo, with 512Kb RAM, two floppy disk drives and a Kempston mouse. 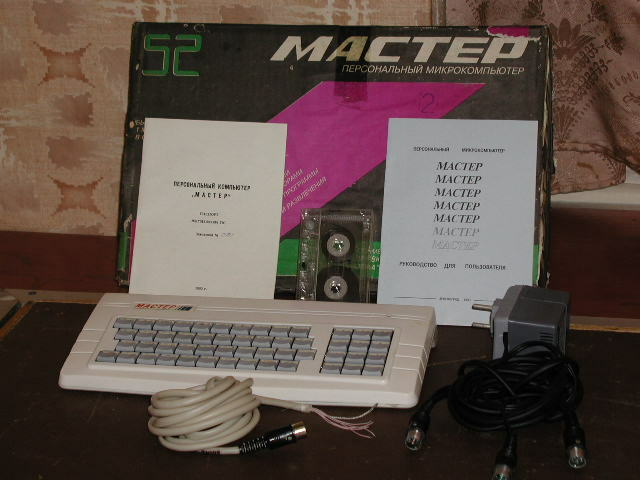 Fairly standard Spectrum clone with a built-in Kempston joystick port and output to RGB, Hercules or EGA monitors as well as the ability to switch between Latin and Russian fonts. Clone of the Spectrum produced by military plants as part of a conversion process (swords into Spectrums? ), and consequently rated rather more reliable than most clones. Considerably developed Spectrum clone using a Z80B 7Mhz CPU with 256K RAM, giving it fair compatibility with a Spectrum 128. It comes with serial and parallel ports, a disk drive controller and TR-DOS. The machine is still being developed in Russia. Generic Spectrum clone with 64Kb RAM and 16Kb ROM. 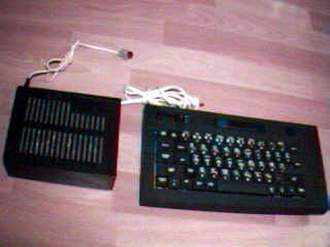 A Moldovan-produced copy of the Spectrum+, with TV and monitor output and built-in joystick ports. Generic Spectrum clone with Roman and Cyrillic font switchability. The machine uses a locally-developed KP580-80A as its CPU, in place of the original Z80. In a retrograde step, it has a ZX81-style flat membrane keyboard in place of the more usual PC-style keyboard found on Russian Spectrum clones. Easily the most radically developed clone, barely recognisable as a Spectrum. Has a Z84C15 CPU running at 28MHz (switchable to 3.5MHz for backwards compatibility), 4Mb RAM and a 128K ROM. Storage is provided by a 3.5" or 5.25" floppy disk drive and a hard disk controller is provided. Two serial and parallel ports are provided, along with two ISA-standard expansion slots. AY-3-8910 or COVOX sound chips produce sound. The machine generates up to 16m colours, of which 512 can be on screen at once in 640x256 resolution. TR-DOS and MS-DOS are supported. Spectrum clone (apparently also marketed as "ZX Frium 2"), capable of operating in PC-standard 640x200 (CGA) mode. Unusually, it used two Z80 CPUs - the extra one was used as a video controller. Somewhat modified clone of the Spectrum with 1Mb RAM and added CP/M mode. It also had parallel and serial ports, a sound processor, a hard disk interface and a "turbo mode". Several clones of the ZX Spectrum were produced and distributed under the same name as the UK original, or under no apparent name at all. They appear to have shared very similar specifications.